Do not lose hope if you're still looking for a Hewlett-Packard TouchPad after the PC maker recently launched a fire sale for its discontinued tablet. HP on Saturday started selling the 16GB TouchPad for $99 and the 32GB model for $149. It didn't take long for major retailers to follow suit, and by mid-day Saturday, TouchPad fire sales had ended at most major retailers including Best Buy, Office Depot, Sears, Staples and Walmart. 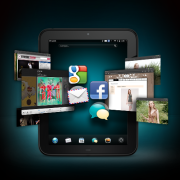 The good news is, if you missed the first wave of TouchPad madness, but are still holding onto your cheaply priced webOS dream there is still hope. Right now, several retailers are selling regularly TouchPads and there's a good chance prices may come down in the near future. HP is also promising a second wave of TouchPads in the next few days. Here is a look at six sites you'll want to keep an eye on this week. HP.com: The TouchPad manufacturer isn't making any more TouchPads but is promising a second wave of fire sale prices early this week. You can sign up for an email notification on HP's site to get an alert when (or if) another round of TouchPad inventory goes on sale. Barnes And Noble: Barnes And Noble's site is showing 16GB HP TouchPads for $102. Some online shoppers are claiming their purchases are being rejected via email after purchasing, while others are claiming to have received confirmations. It's not clear if you'll get a TouchPad from the bookseller, but it's worth a shot. eBay and Amazon: You won't find a $99 TouchPad on either site, but you will find some relatively cheap HP tablets from third-party sellers. Current auction prices for TouchPads on eBay range anywhere from $177-$300; Amazon has tablet prices under $300. Your best bet is to keep an eye on the pricing and see if there are any changes over the next few days. You'll also want to make sure you keep an eye on the seller reviews for any item you're interested in. Be wary of any seller accounts that are less than a week old. SlickDeals: There's a very active forum for TouchPads over at SlickDeals.net. This is a great resource for finding any of the latest deals (or lack thereof). You can bet that SlickDeals will be updated the minute HP starts selling TouchPads again. Buy.com and Newegg: Keep an eye on online retail outlets like these. At the time of this writing, Buy and Newegg were both showing HP TouchPads at regular prices or higher starting at $399 all the way up to $535. Those TouchPad prices could sink unless small businesses or other customers snap them up at the inflated prices. You can sign up for price alerts on Newegg, but you'll have to keep an eye on Buy.com the old fashioned way. Found any great deal sites for the TouchPad? Let us know in the comments.